The Ulster Club Football quarter-final between St Eunan's and Roslea will go ahead in Letterkenny on Sunday. This is even though Naomh Conaill will now have an appeal against their Donegal semi-final defeat by Glenswilly heard by the Ulster Council. On Friday night, Naomh Conaill successfully pleaded to the GAA's Central Appeals Committee that the Ulster body should hear their appeal. The Ulster Council had initially thrown out the Naomh Conaill appeal. The provincial body had apparently rejected the appeal on the grounds that the Naomh Conaill paperwork had not been in order. Naomh Conaill are appealing against their Donegal semi-final defeat by Glenswilly in which there was a late black card controversy. This arose from Glenswilly's Ciaran Bonner incorrectly not being awarded a red card in the semi-final two weeks ago. Bonner should have been dismissed in the closing stages after receiving yellow and black cards. Instead, he was black carded and his replacement Oisin Crawford scored a late point. Crawford's score helped the defending Glenswilly earn a 0-10 to 0-8 victory which set up the decider won by St Eunan's last weekend. Naomh Conaill's initial appeal to the Donegal county board was rejected after a process which included Bonner's black card being rescinded. 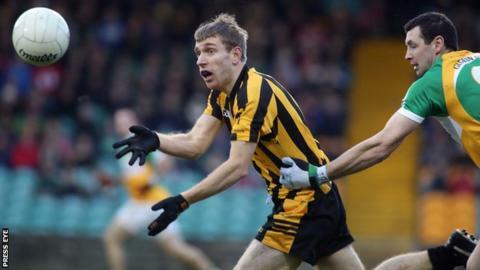 Despite the uncertainty, St Eunan's are said to have prepared diligently for Sunday's game with the Fermanagh champions with no major celebrations having been undertaken following last weekend's Donegal Final win. The Eunan's team includes Donegal star Rory Kavanagh and former county players John Haran and Conal Dunne, who hit five points in the county final. Roslea, as ever, will be spearheaded by three Quigley brothers. The Fermanagh champions's game plan usually involves direct long balls into Seamus and Sean Quigley. Sunday's other quarter-final will see Slaughtneil facing Cavan Gaels. Slaughtneil full-back Brendan Rogers is set to miss the Owenbeg encounter. Dual player Rogers has a hamstring injury and is likely to be replaced by Conan Cassidy. Rogers has had an impressive season for Slaughtneil's footballers in addition to impressing for the club's hurlers. A late goal enabled Slaughtneil to beat four-in-a-row seeking Ballinderry in the Derry Football Final. Rogers's absence will be a blow to Slaughtneil's defence and there will be even more responsibility on the shoulders of the Derry side's centre half-back Chrissy McKaigue. McKaigue and his fellow defenders will face the challenge of subduing Gaels attackers Martin Dunne, Seanie Johnston and Michael Lyng. The Slaughtneil backs impressively curtailed Ballinderry's star attackers Ryan Bell, Enda Muldoon, Conleith Gilligan and Collie Devlin in the Derry decider. Even though Rogers is absent, Slaughtneil will fancy their chances of doing the same to the Cavan champions although Gaels manager Peter Canavan will no doubt have a plan up his sleeve.